"I've had one desire since I was born; to see my body ripped and torn." The lyrics of death metal band Bloodbath's cannibalism-themed track, Eaten, do not leave much to the imagination. But neither this song - nor the gruesome lyrics of others of the genre - inspire violence. That is the conclusion of Macquarie University's music lab, which used the track in a psychological test, the BBC reports. It revealed that death metal fans are not "desensitised" to violent imagery. 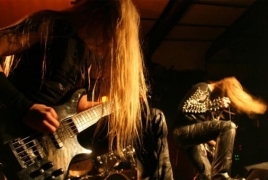 "[Death metal] fans are nice people," said Prof Bill Thompson, from the Australian university, which is based in Sydney. "They're not going to go out and hurt someone." "Many people enjoy sad music, and that's a bit of a paradox - why would we want to make ourselves sad?" he asked. "The same can be said of music with aggressive or violent themes. For us, it's a psychological paradox - so [as scientists] we're curious, and at the same time we recognise that violence in the media is a socially significant issue." With a classic psychological experiment that probes people's subconscious responses; and by recruiting death metal fans to take part. The test involved asking 32 fans and 48 non-fans listen to death metal or to pop, whilst looking at some pretty unpleasant images. Lead researcher Yanan Sun explained that the aim of the experiment was to measure how much participants' brains noticed violent scenes, and to compare how their sensitivity was affected by the musical accompaniment. "We used 'Happy' by Pharrell Williams as a [comparison]," said Dr Sun. Each participant was played Happy or Eaten through headphones, while they were shown a pair of images - one to each eye. One image showed a violent scene, such as someone being attacked in a street. The other showed something innocuous - a group of people walking down that same street, for example. "It's called binocular rivalry," explained Dr Sun. The basis of this psychological test is that when most people are presented with a neutral image to one eye and a violent image to the other - they see the violent image more. "The brain will try to take it in - presumably there's a biological reason for that, because it's a threat," Prof Thompson explained. "If fans of violent music were desensitised to violence, which is what a lot of parent groups, religious groups and censorship boards are worried about, then they wouldn't show this same bias. "But the fans showed the very same bias towards processing these violent images as those who were not fans of this music." "We don't have any issue with it," Bloodbath's lead singer Nick Holmes told BBC News. "The lyrics are harmless fun, as the study proved." He added that Bloodbath's lyrical content was "basically an aural version of an 80s horror film". "The majority of death metal fans are intelligent, thoughtful people who just have a passion for the music," he said. "It's the equivalent of people who are obsessed with horror movies or even battle re-enactments." Prof Thompson said the findings should be "reassuring to parents or religious groups" concerned about violent music. More broadly, there is still concern that violence in media leads to social problems. "If you're desensitised to violence, perhaps you wouldn't care if you saw someone on the street getting hurt - you wouldn't help."